All rights reserved — (c) copyright 2012…2015 by WoS (Wolfgang Scherr). www.pin4.at Credits go to the implementors of the T80 core (from opencores.org). Ver 1.0. 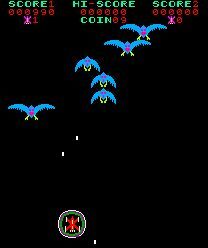 Phoenix is an outer space-themed, fixed shooter video game similar to Taito’s Space Invaders and released in 1980. The game’s developer is unknown. 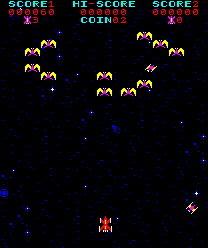 According to Centuri’s Joel Hochberg, the game was licensed from “a smaller Japanese developer.” Amstar Electronics. 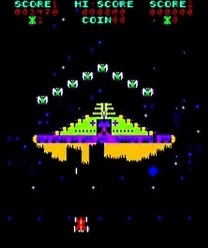 The player controls a spaceship that moves horizontally at the bottom of the screen, firing upward. 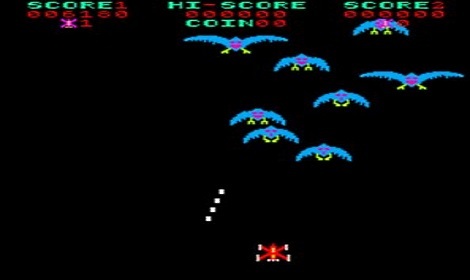 Enemies, typically one of two types of birds, appear on the screen above the player’s ship, shooting at it and periodically diving towards it in an attempt to crash into it. The ship is equipped with a shield that can be used to zap any of the alien creatures that attempt to crash into the spaceship. The player cannot move while the shield is active and must wait approximately five seconds before using it again. 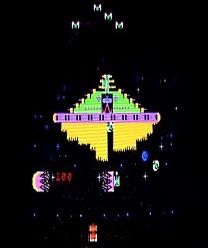 The player starts with three or six lives, depending on the settings. Each level has five separate rounds. The player must complete a round to advance to the next. 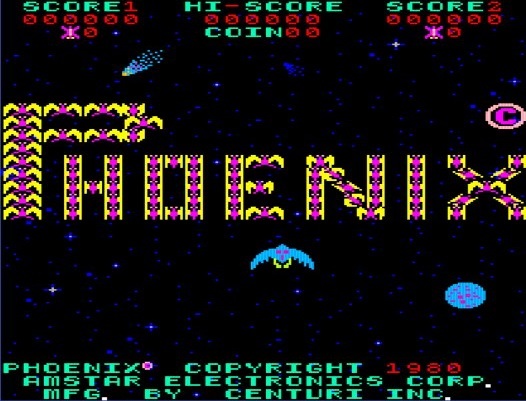 Here you can download the latest Pheonix core as well as Replay specific drivers. Redistributions in synthesized form must reproduce the above copyright notice, this list of conditions and the following disclaimer in the documentation and/or other materials provided with the distribution. Neither the name of the author nor the names of other contributors may be used to endorse or promote products derived from this software without specific prior written permission. The copyright of the ROM images is owned by third parties, thus the above does not apply to them. You have to be entitled separately to use the ROM images together with the FPGA Pheonix design. Owning an original PCB might be ok, but I am not liable for any copyright violations that arise from your use of the FPGA Pheonix design. I will ignore any requests for a copy of the ROM images. THIS SOFTWARE IS PROVIDED BY THE COPYRIGHT HOLDERS AND CONTRIBUTORS “AS IS” AND ANY EXPRESS OR IMPLIED WARRANTIES, INCLUDING, BUT NOT LIMITED TO, THE IMPLIED WARRANTIES OF MERCHANTABILITY AND FITNESS FOR A PARTICULAR PURPOSE ARE DISCLAIMED. IN NO EVENT SHALL THE AUTHOR OR CONTRIBUTORS BE LIABLE FOR ANY DIRECT, INDIRECT, INCIDENTAL, SPECIAL, EXEMPLARY, OR CONSEQUENTIAL DAMAGES (INCLUDING, BUT NOT LIMITED TO, PROCUREMENT OF SUBSTITUTE GOODS OR SERVICES; LOSS OF USE, DATA, OR PROFITS; OR BUSINESS INTERRUPTION) HOWEVER CAUSED AND ON ANY THEORY OF LIABILITY, WHETHER IN CONTRACT, STRICT LIABILITY, OR TORT (INCLUDING NEGLIGENCE OR OTHERWISE) ARISING IN ANY WAY OUT OF THE USE OF THIS SOFTWARE, EVEN IF ADVISED OF THE POSSIBILITY OF SUCH DAMAGE.